Compare nursing homes in a state based on the deficiencies cited by regulators and the penalties imposed in the past three years. 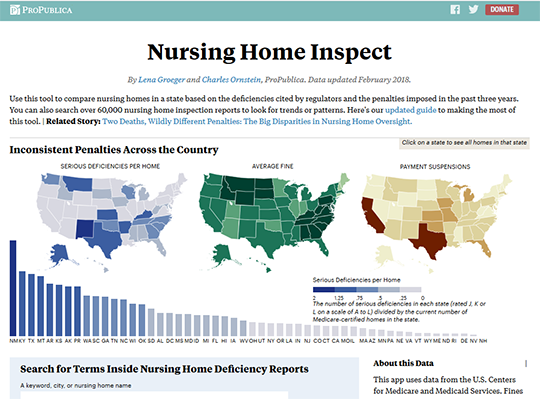 Inspection reports data, from the U.S. Centers for Medicare and Medicaid Services, is available for over 60,000 nursing homes. Fines are listed for the past three years if a home has made partial or full payment (fines under appeal are not included). Information on deficiencies come from a home’s last three inspection cycles, or roughly three years in total. Special focus facilities, or homes flagged for having a history of serious quality issues, are marked with an sign. State-by-state breakdown of the data is available.